The amPlug Series of palm-sized headphone guitar amps make it easy to enjoy great guitar sounds at home, in your room, or anywhere. Simply plug the amPlug directly into any guitar, attach a pair of headphones, and you’re ready! Use the AUX input jack to plug any CD/MP3 player right into the amPlug and jam along. • Plugs directly into your guitar/ bass —a great-sounding headphone guitar amp that gives you serious sound fast. • AUX in jack lets you jam along with your CD/MP3 player. • 100% analog circuit faithfully simulates the response of the original amps. 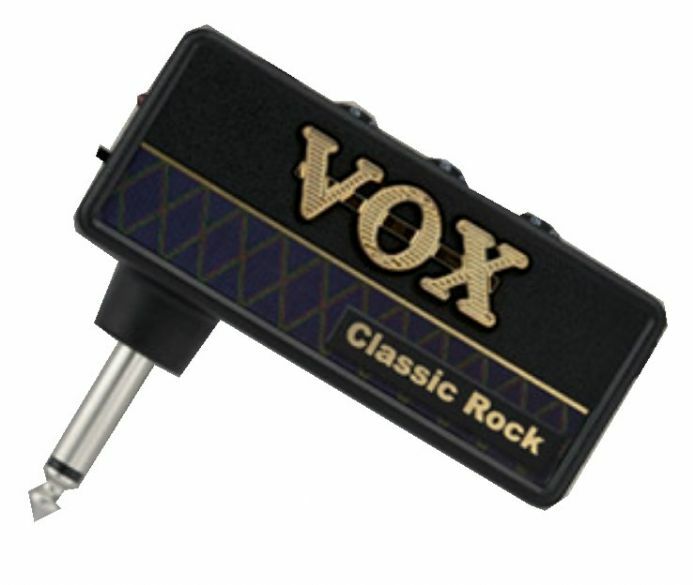 • Classic Rock gives you the great high-gain sound of a UK-made 100W amp. • Up to 15 hours of battery life with two Alkaline AAA batteries. • Quick and easy setup! Just connect amPlug to your guitar and enjoy serious sound. 'Classic Rock' uses four classical gain circuits to deliver that great sound. Ideal! Battery life: with alkaline batteries: approximately 27 hours (with zinc-carbon batteries: approximately 10 hours.) Dimensions (W x D x H): 86 x 80 x 31 (mm), 3.39" x 3.15" x 1.22"
Weight: 40g /1.41oz. (not including batteries).